I'm not sure a worse design fiasco could have befallen Olumo Rock with this f'ugly tiered-lift structure had they organised an international competition, which only the nastiest-minded office-block sharkitects could enter. I found myself praying for a bomb, not on Slough, but just below the rock..
Aaaaargh !!!!! it is deeply frustrating when some educated illiterate asks you to 'draw me a plan' and 'can i have two lions on the gate posts' ... better still ' the plan was good but the design was bad' ... or when the NEEDS document proposes to 'train architects to design low cost housing' ... shows that no one has a clue what architects do and their valuable contribution to society ...The medoicrity we are witnessing is a consequence of a procurement process based on paddy paddy and chop chop ... a lack of sense of duty to society ... OK time to calm down ... we have got talent somewhere we just need to reinject a sense of worth and value back into the profession partculary in Nigeria. I saw the NCC headquarters last year, 'monstrous carbuncle' as description would be flattery.... this is what happens when you let the area boys rule you. i guess my taste in architecture is different. Thanks for the pictures from your travelogue. They're very informative and show a Naija that I never get to see. Great job! 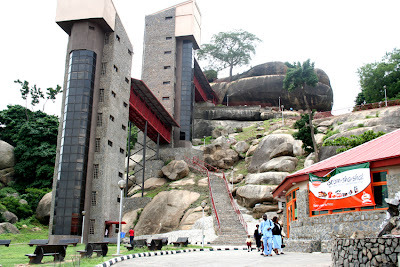 Climbing up to Olumo rock is one of my fondest memories in Nigeria. Climbing up to the top with a group of friends and a tour guide. It is also the only time I've seen a crocodile in Nigeria, we saw one lying in the sun somewhere near where that bottom tower has been built. Your post has reminded me that I need to find my old photos. Thanks Jeremy for showing us the beauty of SW Nigeria. I don't think the design is that bad.I know we naija ppl are used to settling for less but i think the Gov that modernised the place did a good job.